All of us belong to different groups – social, ethnic, racial, economic, religious, etc. Yet often, many, or most, of our close friends are members of our same groups. Growing up, every child I knew was white and certainly all of my close friends. But it doesn’t need to be like that for my children. Actually, it would be better if it weren’t. We interact with friends on a different level than we do with acquaintances, colleagues, and sometimes even family. That’s because friendship triggers some of the most powerful, and positive, human emotions and behaviors. We trust friends with our personal thoughts and feelings, and we trust that what they share with us is real. We share with our friends, and we choose to help them. They teach us empathy. Our friends help us understand who we are and who we want to be. Having a close friend who has a different skin color, religion, or cultural background is especially powerful. Research has found that children with diverse friends (“cross-group friends” in social psychology-talk) have higher levels of social competence  and increased self-esteem, well-being and resilience . They also tend to be better at perspective-taking, which makes them better able to understand how children around them feel and more likely to think race-based discrimination is wrong . Interestingly, research has even shown that children with cross-group friends show more leadership potential and are more popular . 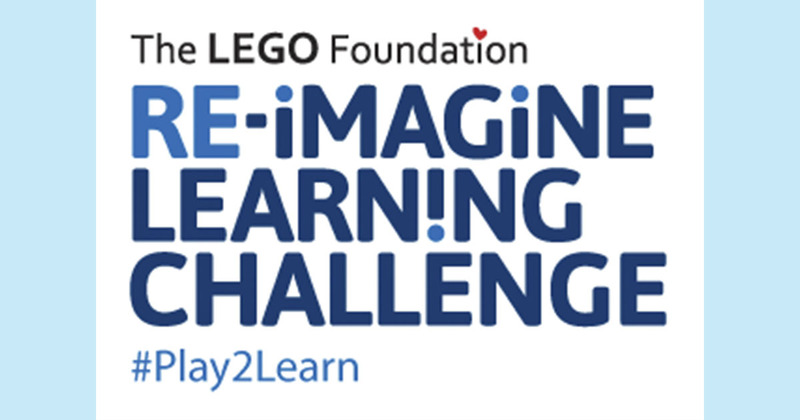 Diverse friendships basically build key 21st century skills through fun and informal pathways. And these skills and attitudes will benefit all children and their communities. This is incredibly impressive and good news for children everywhere. But that doesn’t mean that we’re there yet. We need to understand where and how cross-group friendships form. School is often one of the first places that children interact with peers from outside their familiar groups, and this opportunity to interact is important. Unfortunately, it’s not always enough. Simply having a diverse group of children in a school does not mean that the children will form cross-friendships. As has been observed in lunchrooms across the country, children choose to self-segregate into their familiar groups. Too often, white kids sit together, Asian kids sit together, black kids sit together and so on. Even with the opportunity to mix, close cross-group friendship have been found to remain relatively uncommon, are less durable, and decline with age. What’s going on? Actually, a lot. And when we understand all the moving parts, we can use them to remove obstacles and encourage cross-group friendship. A new theoretical model called ‘Confidence in Contact’ lays it all out. Contact ready children have the confidence, skills, beliefs and experiences that encourage them to engage positively with cross-group peers and to in turn form high-quality cross-group friendships . Using concrete examples and research studies from around the globe, authors Rhiannon Turner from Queen’s University Belfast and Lindsey Cameron from the University of Kent explain the six factors that collectively serve as an overarching predictor of cross-group friendship. Six factors that predict cross-group friendship. Intergroup anxiety – This is the apprehension and nervousness felt when thinking about and interacting with someone outside your bubble. There may be concerns about behaving inappropriately, appearing to be prejudiced, or fear of rejection or discrimination . 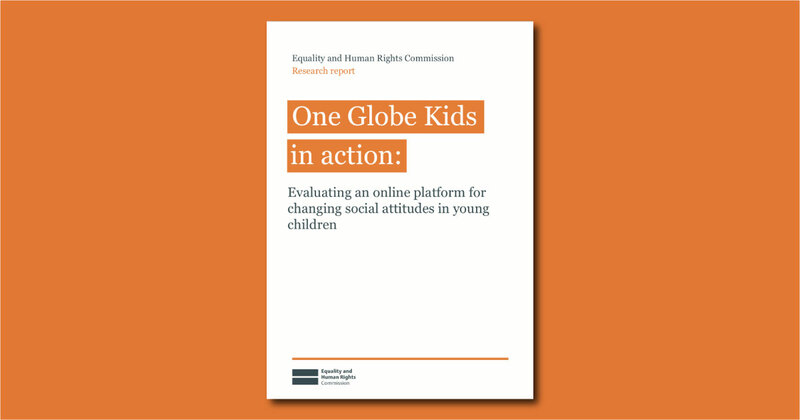 For children, majority and minority status children may have different concerns. Minority children may be more worried about being victimized or discriminated against while majority children may be concerned about “saying the wrong thing”. By reducing feelings of anxiety related to intergroup reaction, we can remove one of the obstacles to cross-group friendship. Intergroup attitudes – How we feel and think about others influences our behavior. When children have negative feelings and attitudes about peers in other groups they’re more likely to avoid interacting with them even if such opportunities exist. Conversely, positive attitudes increase the likelihood of interaction. If we can improve children’s attitudes about those in other groups, and even increase their perceived value of cross-group friendship, we increase the likelihood that they’ll choose to engage. Social norms and school climate – It’s hard to understate the influence of a child’s group of friends and that group’s social norms, i.e. the group’s collective understanding of acceptable behavior. When a group’s social norms are positive and inclusive about cross-group friendship, it is less dangerous for it’s members to have friends from other groups because they don’t fear social rejection for doing so. As children spend a significant amount of time at school, that environment and the people in it have a big impact on what is socially accepted and what isn’t. Teachers’ personal attitudes play an important role in building a school climate supportive of respect, tolerance and good intergroup relations. Their attitudes towards diversity and even their implicit, unconscious responses to those in other groups are picked up on by students and can influence their attitudes and behavior. While social norms can create conditions in which positive intergroup relations can thrive , they can also negatively influence relations. We must look for opportunities to build the social norms and school atmosphere that support inclusion. Expectations of similarity – We’re more likely to become friends with someone who we think is similar ourselves. Unfortunately, this can be an obstacle to cross-group friendship because children typically assume they are most similar to children within their own group. Focusing on similarities with others can lead to reduced anxiety and more interest in future intergroup contact. Self-efficacy – Self-efficacy is how confident you are in your ability to carry out a particular behavior to achieve a specific outcome. Do you feel capable making a cross-group friend? Or do you worry that maybe you won’t be good at it? When children feel more confident about their abilities for a specific activity, they’re less worried about doing it, which makes them more likely to do it and more likely to choose to repeat it. If you’ve already had a positive interaction with some one outside your group, you feel more capable about stepping out of your bubble the next time as well. This confidence in one’s ability to act has also been identified as an important factor in standing up to bullies. In a study about intergroup bullying, adolescents with more self-efficacy (confidence) about their ability to intervene demonstrated greater bystander intentions in a bullying situation, meaning they’d be more willing and likely to step in and assist the victim. 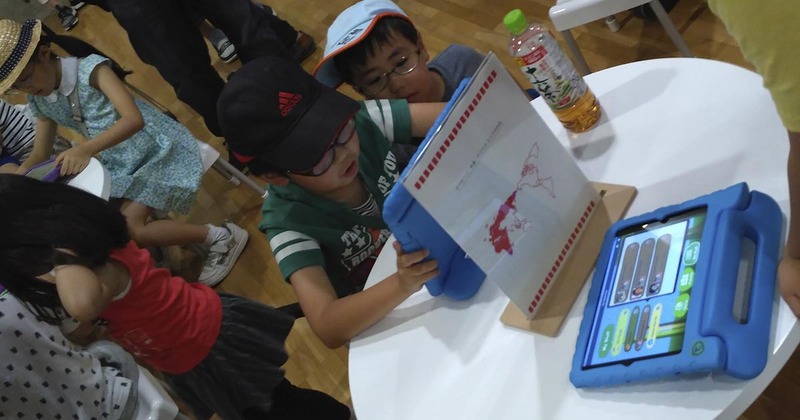 Socio-cognitive development – Beyond contact experiences themselves, children’s developing socio-cognitive abilities influence how they experience diversity. A child’s ability to empathize, take another’s perspective, and reconcile differences (to recognize that people have different perspectives to one’s own and that both are equally valid) can influence their ability to make cross-group friends. It may be that children with cross-group friends develop greater socio-cognitive skills. But it could also be that children with higher socio-cognitive skills are better equipped to form cross-group friendships. In part 2, we’ll dive deep into how we can use these factors to increase cross-group friendship in children worldwide. Until then, keep learning and thinking and moving forward, we’ll get there, I promise. Eisenberg, Vaughan, & Hofer, 2009; Lease & Blake 2005. Bagci et al., 2014; Fletcher, Rollings, & Nickerson, 2004. Killen et al., 2007, Tropp & Prenovost, 2008. Kawabata & Crick, 2008; Lease & Blake, 2005. Aboud & Sankar, 2007; McDonald et al., 2013; Wilson, Rodkin, & Ryan, 2014. Page-Gould, Mendoza-Denton, & Mendes, 2014. Cialdini, Kallgren, & Reno, 1991. Castelli, De Dea, & Nesdale, 2008; Vezzali, Giovannini, & Capozza, 2012a. Nesdale, Griffith, Durkin, & Mass, 2005; Dejaeghere, Hooghe, & Claes, 2012. West, Magee, Gordon, and Gullett, 2014. Abbott, N., & Cameron, L. (2014).What makes a young assertive bystander? The effect of intergroup contact, empathy, cultural openness, and ingroup bias on assertive bystander intervention intentions. Journal of Social Issues, 70, 167–182. Aboud, F. E. (1981). Egocentrism, conformity, and agreeing to disagree. Developmental Psychology, 17(6), 791–799. Aboud, F . E., & Sankar, J. (2007). Friendship and identity in a language-integrated school. International Journal of Behavioral Development, 31(5), 445–453. Aboud, F. E., Mendelson, M., & Purdy, K. (2003). Cross-race peer relations and friendship quality. International Journal of Behavioral Development, 27(2), 165–173. Ajzen, I. (2006). Constructing a TPB questionnaire. Retrieved from http://people.umass.edu/aizen/pdf/tpb.measurement.pdf. Bagci, S. C., Kumashiro, M., Smith, P. K., Blumberg, H., & Rutland, A. (2014). Cross-ethnic friendships: Are they really rare? Evidence from secondary schools around London. International Journal of Intercultural Relations, 41, 125–137. Binder, J., Zagefka, H., Brown, R., Funke, F., Kessler, T., Mummendey, A., & Leyens, J. P. (2009). Does contact reduce prejudice or does prejudice reduce contact? A longitudinal test of the contact hypothesis among majority and minority groups in three European countries. Journal of Personality and Social Psychology, 96(4), 843–856. Byrne, D., & Nelson, D. (1965). The effect of topic importance and attitude similarity-dissimilarity on attraction in a multistranger design. Psychonomic Science, 3(1-12), 449–450. Castelli, L., De Dea, C., & Nesdale, D. (2008). Learning social attitudes: Children’s sensitivity to the nonverbal behaviors of adult models during interracial interactions. Personality and Social Psychology Bulletin, 34(11), 1504–1513. Cialdini, R. B., Kallgren, C. A., & Reno, R. R. (1991). A focus theory of normative conduct: A theoretical refinement and reevaluation of the role of norms in human behavior. In Advances in experimental social psychology (Vol. 24, pp. 202–232). San Diego: CA: Academic Press, Inc.
Dejaeghere, Y., Hooghe, M., & Claes, E. (2012). Do ethnically diverse schools reduce ethnocentrism?A two-year panel study among majority group late adolescents in Belgian schools. International Journal of Intercultural Relations, 36(1), 108–117. Eisenberg, N., Vaughan, J., & Hofer, C. (2009). Temperament, self-regulation, and peer social competence. In K. H. Rubin, W. M. Bukowski, & B. Laursen (Eds. ), Handbook of peer interactions, relationships, and groups (pp. 473–489). New York, NY: The Guilford Press. Fletcher, A. C., Rollins, A., & Nickerson, P. (2004). The extension of school-based inter-and intraracial children’s friendships: influences on psychosocial well-being. American Journal of Orthopsychiatry, 74(3), 272–285. Grutter, J., & Meyer, B. (2014). Intergroup friendship and children’s intensions for social exclusion in integrative classrooms: the moderating role of teachers’ diversity beliefs. Journal of Applied Social Psychology, 44(7), 481–494. Kawabata, Y., & Crick, N. R. (2008). The role of cross-racial/ethnic friendships in social adjustment. Developmental Psychology, 44(4), 1177–1183. Killen,M., Crystal, D., &Ruck, M. (2007). The social developmental benefits of heterogeneous school environments. In E. Frankenberg & G. Orfield (Eds. ), Lessons in integration: Realizing the promise of racial diversity in American schools (pp. 57–73). Charlottesville, VA: University of Virginia Press. Lease, A. M., & Blake, J. J. (2005). 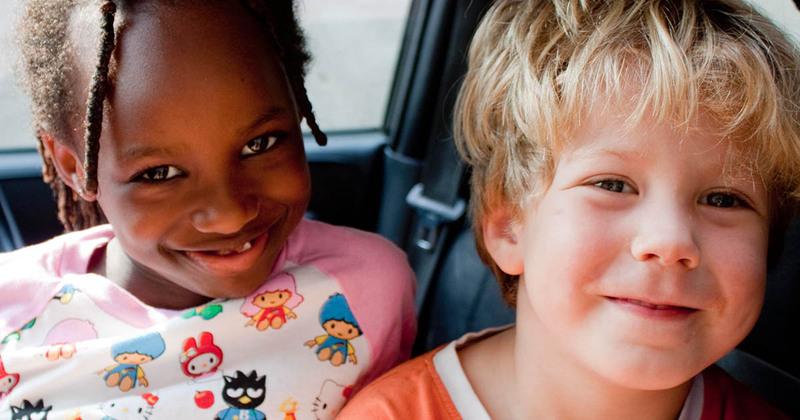 A comparison of majority-race children with and without a minority-race friend. Social Development, 14(1), 20–41. McDonald, K. L., Dashiell-Aje, E., Menzer, M. M., Rubin, K. H., Oh, W., & Bowker, J. C. (2013). Contributions of racial and sociobehavioral homophily to friendship stability and quality among same-race and cross-race friends. Journal of Early Adolescence, 33, 897–919. Nesdale, D., Maass, A., Durkin, K., & Griffiths, J. (2005). Group norms, threat, and children’s racial prejudice. Child Development, 76(3), 652–663. Page-Gould, E., Mendoza-Denton, R., & Mendes, W. B. (2014). Stress and Coping in Interracial Contexts: The Influence of Race-Based Rejection Sensitivity and Cross-Group Friendship in Daily Experiences of Health. Journal of Social Issues, 70(2), 256–278. Tropp, L. R., & Prenovost, M. (2008). The role of intergroup contact in predicting interethnic attitudes: Evidence from meta-analytic and field studies. In S. Levy & M. Killen (Eds. ), Intergroup attitudes and relations in childhood through adulthood (pp. 236–248). Oxford: Oxford University Press. Turner, Rhiannon N., & Cameron, Lindsey. (2016). 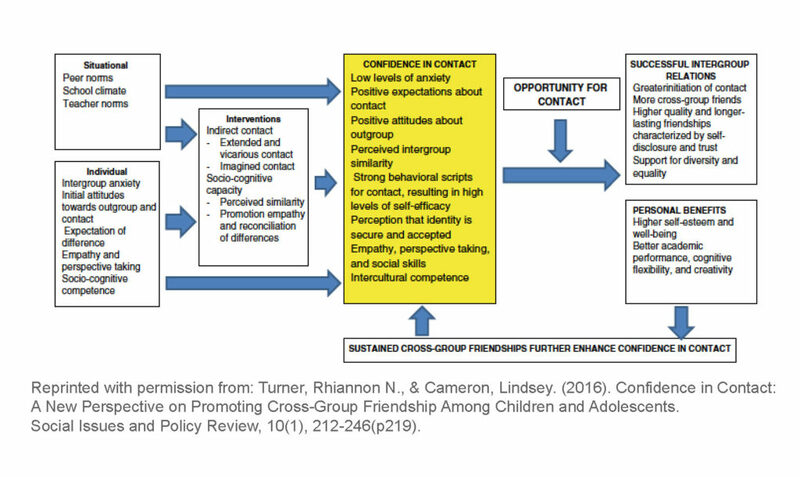 Confidence in Contact: A New Perspective on Promoting Cross-Group Friendship Among Children and Adolescents. Social Issues and Policy Review, 10(1), 212-246. Rutland, A., & Killen, M. (2015). A Developmental science approach to reducing prejudice and social exclusion: Intergroup processes, social-cognitive development, and moral reasoning. Social Issues and Policy Review, 9(1), 121–154. Vezzali, L., Giovannini, D.,&Capozza, D. (2012a). Social antecedents of children’s implicit prejudice: Direct contact, extended contact, explicit and implicit teachers’ prejudice. European Journal of Developmental Psychology, 9, 569–581. West, T. V., Magee, J. C., Gordon, S. H., & Gullett, L. (2014). A little similarity goes a long way: The effects of peripheral but self-revealing similarities on improving and sustaining interracial relationships. Journal of Personality and Social Psychology, 107(1), 81–100. Wilson, T. M., Rodkin, P. C., & Ryan, A. M. (2014). The company they keep and avoid: Social goal orientation as a predictor of children’s ethnic segregation. Developmental Psychology, 50(4), 1116–1124. With your support Globe Smart Kids will be able to help more young children engage in diversity.